Get rid of mild acne fast using benzac ac gel 2.5% it uses benzoyl peroxide, which is responsible for killing the bacteria that causes the pimples and unclog pores to prevent blackheads and whiteheads. 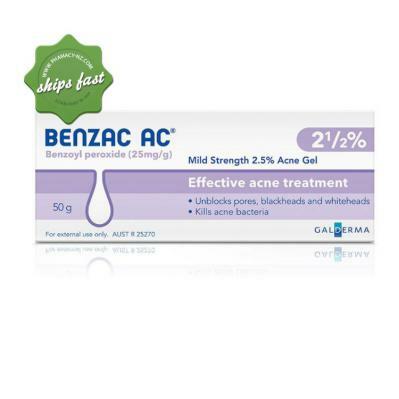 Get rid of mild acne fast by using Benzac AC 2.5% gel is great for treating acne prone skin it kills acne forming bacteria and unplugs clogged pores in the skin and has specially beads which absorb oils and release glycerin to moisturise dry, irritated skin. It contains benzoyl peroxide, which is responsible for killing the bacteria that causes the pimples and unclog pores to prevent blackheads and whiteheads. Remove excess oil and hydrate your skin. It contains benzoyl peroxide that helps unblock pores and kill acne bacteria within 48 hours. Removing excess oil and hydrating the skin. AC are the initials for Acrylates Copolymer beads which act to absorb oils and release glycerin to moisturise dry, irritated skin. Contains ingredients that absorb excess oils and releases Glycerol which reduces the risk of irritation. Active: benzoyl peroxide 25 mg/g. Inactive: docusate sodium, disodium edetate, poloxamer 182, carbomer 940, propylene glycol, acrylates copolymer, glycerin (glycerin), silicon dioxide, sodium hydroxide, and purified water. Step 1 - Wash your hands and the affected area with a mild skin cleanser. Rinse with water and pat skin dry. Step 2 - Apply a thin film of Benzac AC Gel to the affected areas once daily. Leave it on the skin for 2 hours. Then wash it off with water. Pat skin dry. Step 3 - Apply a light moisturiser which won't clog pores. After three days, if no discomfort is felt, apply Benzac AC Gel in the evening. Leave it on all night. After 3 days if no discomfort occurs apply in the evening and leave on all night. If after 3 days, there is no redness or peeling and your skin is not improving, apply twice daily morning and night. Do not apply to eyes, Lips, Mouth or sensitive areas of the neck. Discontinue use if excessive redness or peeling occurs. After you have used it for one month, you should see your doctor or pharmacist again so they can check the improvement in your condition. What strength Benzac AC Gel is most ideal for you? There are 3 strengths of Benzac AC Gel. 2.5%, 5% and 10%. 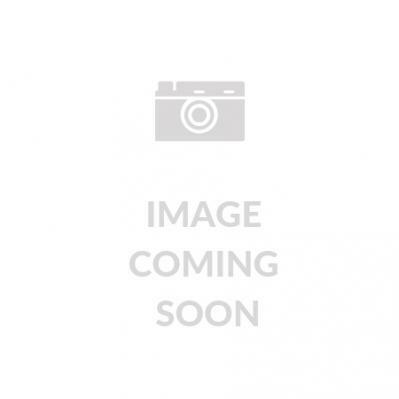 The percentage refers to the amount of the active benzoyl peroxide in the gel. 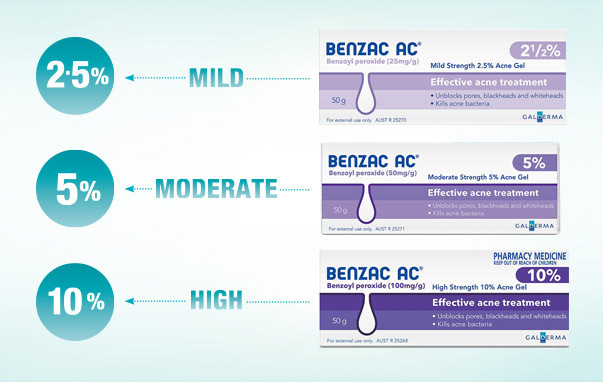 It is recommended that you always begin treatment with either 2.5% or 5% Benzac AC. If your acne persists and provided your skin tolerates the lower strength gel, your doctor or pharmacist may recommend continued treatment with the higher strength gel (10%). Do not apply to eyes, lips, mouth or sensitive areas of the neck. If accidental contact occurs rinse with water and pat dry. Contact may cause irritation. Avoid excessive exposure to sunlight or other sources of ultraviolet light. Do not use harsh skin cleansers & scrubs. Do not use cosmetic products that contain alcohol. Do not use medicated soaps. These things may have an extra drying or irritant effect. Keep cosmetic use to a minimum and avoid oil based cosmetics which can clog the pores. Be careful when using BENZAC gel because benzoyl peroxide can bleach or discolour clothing or towels.